AXIATA Group Bhd will announce in August a sizeable RM1.5 billion to RM3 billion impairment in the carrying value of its investment in Idea Cellular Ltd, which is now part of India’s largest telecom company, Vodafone Idea Ltd. The good news is that this non-cash write-down is likely largely priced in with Axiata shares down over 21% year to date to close at RM4.33 last Friday, giving it a market capitalisation of RM39.3 billion. A RM3 billion write-down could shave 30 sen to 40 sen off Axiata’s valuation, depending on how much value one ascribes to the 8.17% stake that Axiata still has in the enlarged Vodafone Idea, which last Friday officially unseated the previous India No 1 player Bharti Airtel Ltd. Both Indian players continue to face intense competition from strong newcomer Reliance Jio Infocomm Ltd, which is backed by India’s richest billionaire Mukesh Ambani, who wants a 50% share of India’s telecom revenue by 2020. Nonetheless, the non-cash write-down will not affect Axiata’s ability to pay dividends, even if there is a headline loss. “We do acknowledge that a reclassification requires us to register a one-off, non-cash adjustment. However, it neither has any impact on our normalised earnings for the full year nor on our cash position today or in the future. Likewise, this does not reflect the future value of the merged entity, especially given the potential benefits to be derived from the synergies of the two large companies and the consolidation of the industry. Effectively, this exercise is not reflective of Idea or Axiata’s intrinsic value,” Axiata president and group CEO Tan Sri Jamaludin Ibrahim said in a July 27 statement. In fact, at the current share price level, some analysts are telling clients there is a bigger real earnings pool as Axiata no longer needs to equity account losses from Idea, which will no longer be an associate company post its merger with Vodafone India. “This [non-equity accounting] should be positive [for Axiata] in the medium term given the ... continued losses that the combined entity is likely to incur against the background of India’s highly competitive environment, driven by Reliance Jio,” AmInvestment Bank Research analyst Alex Goh writes in a July 26 note. For the record, Axiata’s 19.74% stake in Idea was diluted to 18.1% and thereafter 16.3% in February (RM357.6 million loss) when Axiata did not participate in Idea’s placement exercise. Axiata’s stake will be further diluted to 8.17% on completion of Idea’s merger with Vodafone India. “The merger is now subject to the National Company Law Tribunal, Mumbai Branch, passing the dissolution order of Vodafone Mobile Services Ltd and Vodafone India Ltd, which is expected shortly,” read Idea Cellular’s July 27 statement to India’s stock exchange, which announced the approval by India’s Department of Telecommunications. Axiata is expected to report second-quarter earnings on Aug 23 and the size of the technical impairment will be determined based on Idea’s share price at the point of reclassification on the final completion of the Vodafone-Idea merger, which is expected in August. Still, there are those who think Axiata — which invested over RM5 billion in Idea — would eventually raise additional cash by selling its Vodafone Idea stake and use part of that money to increase dividends to shareholders, including government-owned Khazanah Nasional Bhd, which is Axiata’s largest shareholder with a 37.3% direct and deemed stake as at June 14. Billionaire Kumar Mangalam Birla, of the Aditya-Birla group, which has 26% stake in the enlarged Vodafone Idea, has the right to level holdings with Vodafone, which will have about 45%. If Birla buys Axiata’s stake in Idea, it will need to buy fewer shares from Vodafone to have a larger say. Axiata, expectedly, says it is in no hurry to sell. “Now, as a pure financial investor in the largest player in the Indian market, [Axiata] is better positioned to review and assess the value of this investment. At this point, we have a very strong cash position and, therefore, have no immediate plans to divest or exit, as long as there is no better alternative use of funds that would provide better returns to our shareholders. We will obviously review our position from time to time,” Jamaludin says, adding that Axiata is confident of “significant upside in valuation as synergies are realised”. To be sure, Axiata is not the first to suffer losses in India. At least RM23 billion has been written off or lost by seven foreign telecom firms in India, Axiata points out in a July 27 statement. British mobile phone operator Vodafone last year recorded more than €3 billion impairment on its Indian unit. Three of the nine international players that invested in India in 2012 have exited (Etisalat in 2012, Bahrain Telecom in 2012 and DoCoMo in 2014). Two others have merged with larger players, including Telenor ASA’s Uninor with Singapore Telecommunications Ltd’s Bharti, while Aircel has filed for bankruptcy. Axiata, which first entered Idea in 2008, benefited from close to RM1 billion in operational profit from Idea as the latter grew from the fifth largest player to the third largest mobile operator in India. From 2008 to 2015, Idea’s profit after tax (PAT) saw a 19.5% compound annual growth rate (CAGR) to US$473 million in 2015 from US$136 million in 2008 on the back of 21% CAGR in revenue to US$5.1 billion in 2015 from US$1.35 billion in 2008. In 2016, however, Idea made only US$56 million PAT on US$5.42 billion in revenue. Last year, Idea booked US$519 million losses on revenue of US$4.45 billion. The September 2016 entry of Jio into the India telecom market changed the equation for the incumbents. The availability of spectrum, a clean slate and a deep-pocketed billionaire backer allowed Jio to throw US$35 billion to US$40 billion — more money than the industry’s combined investment the past two decades — into new technology and 4G network rollouts to win over 15% subscriber market share and an even larger revenue share within a short period. Jio caused Bharti to report its first loss in 15 years and Indian operations continued to be in the red when the latest quarterly results were announced last week. Vodafone Idea will serve a customer base of 440 million, representing 39% of the total market while its revenue market share is estimated at 37.5%. Bharti has about 344 million customers. Taking a cue from the EPF? It could take some time before Axiata sees greater value from its Indian investment. 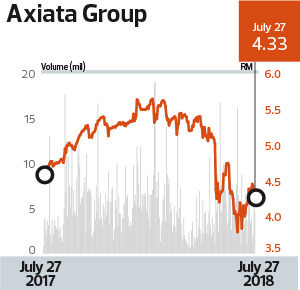 Yet, at least one of Axiata’s major shareholders took advantage of the share price weakness when Axiata shares slipped to their lowest in 6½ years at RM3.80 apiece on June 29. Stock exchange filings show that the Employees Provident Fund (EPF) had a 16.947% stake or 1.53 billion shares in Axiata as at July 11, up 18.4 million shares in one month from 16.743% or 1.515 billion shares as at June 12. Of the 24 price targets available on Bloomberg at the time of writing, only Goldman Sachs’ RM3.90 target price is below last Friday’s RM4.33 close. The largest group of analysts are the 11 who value Axiata shares at RM5 to RM5.50 apiece, implying at least 15% upside potential. Five analysts think Axiata shares are worth RM4.50 to RM4.95 apiece, three others value the shares at RM5.55 to RM5.99 while the four most bullish ones think Axiata should be worth at least RM6 apiece — AmInvestment Bank and TA Securities (RM6.20), Macquarie (RM6.33) and Nomura (RM6.40). Apart from its stake in Vodafone Idea, Axiata also owns 100% of Celcom, 66.4% of XL in Indonesia, 83.3% of Dialog in Sri Lanka, 68.7% of Robi in Bangladesh, 82.5% of Smart in Cambodia, 80% of Ncell in Nepal, 28.7% of M1 in Singapore, 100% of Axiata Digital Sdn Bhd and 63% of tower company edotco Group Sdn Bhd, which may go for an initial public offering next year.